How VPN can secure our data in Wi-Fi hotspots? What Can We Do To Protect Our Privacy In Public Places? Free Wi-Fi would seem to have little downside. Smart business owners know that they need it and the up-side for them is without question. It’s an inexpensive setup with cheap routers that can cover large areas. These very properties also make them great targets for hackers. I believe the problem is that the users like you and I, believe that it’s unlikely that we’ll be so unlucky to be in a coffee shop with a ‘whizz-kid’, super-smart hacker desperately trying to piece together your info so he can wipe out your bank account. It’s not like that at all in reality. The fact is, it’s easier than ever for anyone with a mouse-pad to simply click a couple of buttons and instantly gain access to your life. A hacker can monitor the network traffic of an entire store/coffee-shop with a small device hidden away in his backpack nowadays. The issue isn’t just that these networks are so easy to attack. 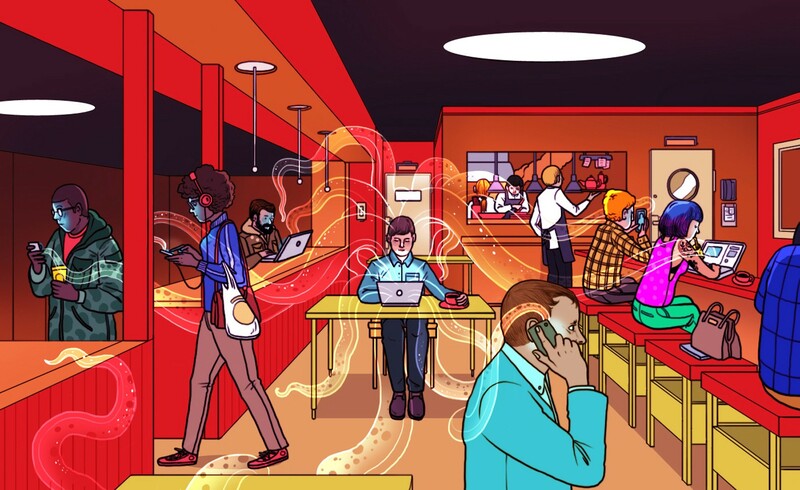 With little, or no awareness that the threat even exists, users constantly expose their valuable personal data over wi-fi hotspots, making the networks a very attractive target. The fact that anyone can join the network is what makes it so unsafe. A password login to join the network might feel reassuring but if everybody knows the password, that’s no better than not having one at all. A hacker’s first job is getting on the same network as you. A public password is a recipe for disaster. One way that Hackers can trick you is have their own network set up in the public place where you are. For example, if the actual network name is ‘StarbucksSeatlle16’, he/she might have ‘SeattleStarbucks16’ and you join that and ‘oops’, you’re in trouble. They now have access, not only to see what you are doing but to save everything you are doing. Creepy stuff. There are ways to encrypt the communication between your computer and any site you visit. Fortunately, the most widely implemented form of encryption involves just taking a look at your browser’s url bar. A site address beginning with “https” (it’s the “s” that’s crucial) indicates that SSL encryption is active. Your browser will display a padlock icon too (in the address bar) to indicate an SSL connection is active. With SSL encryption, the information you send and receive appears garbled to spying eyes, so if your communication is intercepted, it’s not readable. The SSL protocol is one that websites implement on their back-end and it has long been standard procedure for financial institutions and popular sites like Gmail, Facebook, and Twitter. Any decent online shopping site you visit should have SSL enabled when you get to a login page, view your account information, or enter your payment details. If you see any warning pop-ups, don’t use the site. Simple as that. For the best way to ensure that all of your browsing traffic is encrypted, no matter which sites you visit or which apps you use, I highly recommened signing up for a VPN (virtual private network) service. A VPN service adds a physical barrier between you and the internet by routing all of your communication and info, in an encrypted format, through a server controlled by the VPN company. It is only after your encrypted communication passes through this VPN server that it reaches the internet world. Someone spying on you over the Wi-Fi network will just see garbled data passing between your device and this secondary VPN server. Because the communication with the web is actually happening through the middleman (the VPN server) a measure of user anonymity is provided as well. I hope this helps to explain the benefits of staying safe on-line. Let’s all make a point this year of updating our awareness of the very real threats in this new world of ours. Ciao for now. Happy surfing.